Deer season is right around the corner! Did you participate in your County Deer Advisory Council meetings? Wisconsin landowners have control over deer management in their county. Each single county makes up a deer management unit, and there is a County Deer Advisory Council (CDAC) for each unit. CDACs were launched in 2014 by the WI DNR with the goal of increasing public involvement and satisfaction with deer management. CDAC membership is comprised of volunteers and professional natural resource managers from outside the DNR. CDACs have one chair and an alternate chair (both elected from the Wisconsin Conservation Congress), and up to seven members of the public that represent different natural resource interests, a well as tourism, local government, and transportation. CDAC management cycles begin every third autumn, and each spring CDACs create recommendations on harvest quotas, permit limits, and season framework options that attempt to reach management goals of each county. Counties decide whether they want to increase, decrease, or maintain the size of their county’s herd over the next three years. These recommendations are informed by information provided to each CDAC regarding population demographics, harvest trends and statistics, hunter experience, herd health, forest health, agriculture, vehicle collisions and more. CDAC meetings are always open to the public, and CDACs receive public input at meetings and through online public comment periods. Several councils revised their 2016 recommendations based on public comments received from their local communities. After their recommendations are decided within the council, they proceed tot he Natural Resources Board for approval in May. 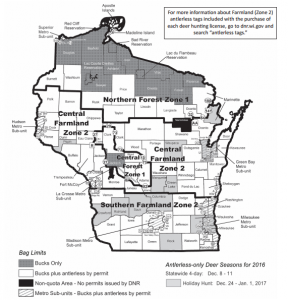 The 2016 deer season includes most counties having separate levels of bonus antlerless tags for public and private land, fewer counties will have buck only harvests due to mild winters over the past two years, all deer licenses will include a Farmland Zone antlerless tag, and thirteen counties are offering an antlerless only Holiday Hunt. To join your local CDAC, visit the CDAC website to find application materials and meeting dates. On the CDAC site, you’ll also find county data, council recommendations, public comment periods, and more.